Very light and portable. To save transfer a file, plug the USB into your computer, open your word processing program, and push the Neo send button. Can also be directly connected to printer. FCC ID NUMBER: K2VDANA001. Dana Portable Word Processors. These word processors were removed from service by a local school system. MODEL: Dana. We powered up each word processor and tested the screen by using the stylus. Processor has been previously used. Item has been cleaned and tested. It has small inventory markings on the side. ITEM CONDITION. ITEM DETAIL. 110-113 ● ASTRA KL. 120-170/171 ● ASTRA KL. Universal Twin 2” Spool Black Nylon Fabric Typewriter Ribbon. Each Ribbon is Factory sealed in for freshness. This ribbon is also know as the following ribbons. Brother Electronic Typewriter AX-15 with Handle,Cord . Condition is Used. Slightly yellow tint from age. Shipped with USPS First Class Package. Smith Corona SC 125 Electric Typewriter With The Power Cord,Cover And The Manual.Tested And Works. Brother GX-6750 Daisy Wheel Electronic Typewriter - FULLY TESTED/WORKS PERFECTLY. Condition is Used. Shipped with USPS Priority Mail. Brother GX-6750 Correctronic Daisy Wheel Electric Electronic Typewriter. Tested and working. It comes with ribbon, but it needs new correction tape. WORD OUT WILL NOT WORK UNTIL YOU REPLACE CORRECTION TAPE. Does not include cover. Please feel free to ask me any questions. 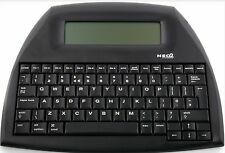 Neo 2 Alphasmart Word Processer Keyboard By Renaissance Learning AlphaWord Plus. AlphaSmart only - no cables/batteries. Neo 2 AlphaWord Plus Word Processer. 110-113 ● ASTRA KL. 120-170/171 ● ASTRA KL. Smith Corona Twin Spool Black/Red Nylon Fabric Typewriter Ribbon. Each Ribbon is Factory sealed in for freshness. This ribbon is also know as the following ribbons. Units may have Zip Code and or School letters engraved on bottom. May also have a number printed on case. USB cable included. ~Alkaline batteries will give you 700 hours of use while cheap batteries will last much much less. USB cables not included. Units have been cleaned and factory reset. BROTHER SX-4000 Electronic LCD Display Typewriter Tested & Working VG Condition. Condition is Used. Overall in good and used condition. Keys are alittle yellowed, but everything looks good. Fully functional and ready to use. You love antiques. You especially love your ROYAL Typewriter, and so do we! Treat yourself to a new ribbon. The ribbon is 12 yds long. ⁃ ROYAL WORLD TRAVELER. ⁃ ROYAL IMPERIAL 202. Buy yourself to a fresh new black nylon ribbon. This typewriter comes in the original with all of the accessories shown in the pictures. This item has been tested and all of the buttons and functions work as good as new! This will need a new Daisy wheel which is sold here on eBay between $12 and $20 I ship fast! Please feel free to ask any questions! Thanks for looking and have a great day! Trending at $65.47eBay determines this price through a machine learned model of the product's sale prices within the last 90 days. Brother SX-4000 Electronic Typewriter. Condition is Used. Shipped with USPS Priority Mail. There is a date 10-18-05 written in black sharpie on it, but works fine. please note the shipping cost will be high because of the size of the box. This typewriter works great and is in nice condition. Also includes power cord and original manual. 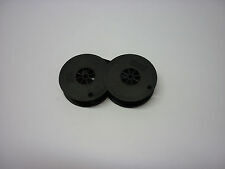 New universal typewriter black ribbon twin spool 1/2 inch FREE SHIPPING! 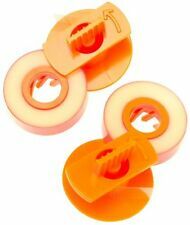 New standard, universal typewriter ribbon. Color is black. If you are unsure if these are what you need, don't hesitate to ask. These AlphaSmart Keyboards are compatible with any PC/Mac that has Windows 98 or newer. AlphaSmart 3000 Portable Laptop Keyboard Word Processor with a USB cable . The AlphaSmart 3000 is the practical, portable, and affordable computing solution for anyone on the go. Includes the typewriter with lid pictured. Smith Corona PWP125 Word Processor Electronic Typewriter/Disk Drive/ Key Cover. Condition is Used. Plugged in Turns On. Screen Functions. Inherited From Family. Selling, Not Knowledgeable With Use of Item. Open To Offers. Made in Western Germany. Used in Good condition. We will do everything within our power to quickly resolve your inquiries. IBM Selectric Five Typewriter Font Balls ScriptGothic(2)CourierPrestigeElite. Condition is Used. Shipped with USPS First Class Package. Olympia Electronic Compact 2 Typewriter Tested! Very good condition. This really looks nice. It does power on and spins on all functions. Correctable Film Ribbon IBM Selectric III IBM Model 210 Black. Condition is New. Shipped with USPS First Class Package. ALPHASMART 3000 Portable keyboard compatible with Mac or Windows. Sale includes the keyboard and AC adapter. The pictures are used as the reference of what is including in the sale. AlphaSmart NEO. 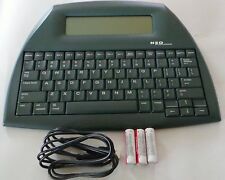 The AlphaSmart is a keyboarding device that enables a person to work on the go, much like a laptop computer, but strictly for word processing, as it functions essentially like a simple digital typewriter. This is tested and has at least enough ink that i was able to print up a test page. has average wear including minor scuff marks and light discoloring due to age. You love antiques?. You especially love your ROYAL Typewriter, and so do we! Treat yourself to a new ribbon. The ribbon is 12 yds long. Buy yourself to a fresh new red and black nylon ribbon. You deserve it! This is for a David Abraham braille typewriter and carrying case. Lightly used from law office.IBM correcting selectric iii typewriter. New, unused but in an open box. We’ve had it for a while but never needed to use it. Looking for a new owner! 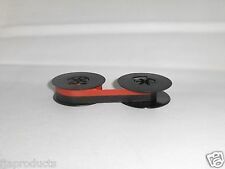 New universal typewriter black and red ribbon twin spool 1/2 inch FREE SHIPPING! New standard, universal typewriter ribbon. Color is black and red. If you are unsure if these are what you need, don't hesitate to ask. Very good condition, works great! Th KMG model was introduced by Royal in 1949. It was mainly used in offices so it was made to handle heavy workloads. Very sturdy, it weighs 28 lbs! It features a longer carriage so as to work with different types of paper. Every Order Supports a Husband & Wife trying to break free. Our goal is to make sure you are satisfied no matter what! 2 PK Smith Corona Galaxie 12 Typewriter Ribbon SCM SC 20 Free Shipping USA! SIX LIFT-OFF TAPES FOR USE WITH ELECTRONIC TYPEWRITERS AND WORD PROCESSORS NEW!